Breakfast Club is a hit. I think I was right, and this video — brand new today — makes me even more sure. Remember, he’s here in Austin on October 3 for a record release show at the Domain. It’s free, and details are here. Austin City Limits Music Festival is right around the corner. With so many fabulous musicians coming in for the festival, the whole city will benefit from the free fringe concerts that pop up all over town. If you have mini music fans at home, bring them to the Hush Hush Music Bash at The Domain for the only Kiddie Limits after party in town! That’s right, we’re bringing a little bit of ACL to you for FREE! Austin’s only after party for kids is going down at Domain II in Amy Donovan Plaza, from 4-7 p.m., on October 3, 2015. With music sponsored by Austin Diagnostic Clinic, the afternoon features performances by Elizabeth McQueen, Tim Kubart with Mother Falcon, and Mario the Magician that will rock mini music lovers’ world—literally. Just when you thought it was time to put the kids to bed…. it’s time to party at the Domain, instead. Elizabeth McQueen will kick off the bash at 4 p.m. Known for her beautiful and timeless vocal style, McQueen’s music brings together the best of multiple genres into groovy, danceable art­ form. Next, Mario the Magician will hit the stage at 5:00 p.m. Part retro, part rock­-and­roll, Mario’s uplifting, highly interactive and ridiculously funny performance is sure to thrill the kids. As part of a multi­city release for his newest album Home, Tim Kubart will perform “indie pop for all ages” with Mother Falcon at 6 p.m., finishing off a night that will have kids begging for more. For updates, check the Facebook event page. 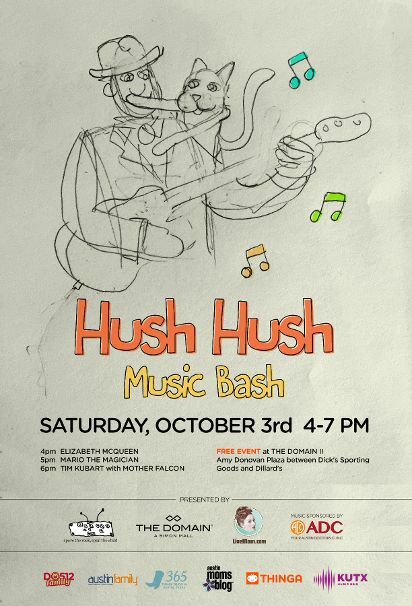 The Hush Hush Music Bash is brought to you by Spare the Rock, Spoil the Child, The Domain and LiveMom.com. See you there!